some sun's ray can get thru, like the say "after the storm, calm is set"
(something like that  :)  ). technical personnel to come later this night to see what went wrong. on the north coast absolutely NO wind, even the rain has stopped! east - is that possible? Punta Cana) right now, hope everybody is ok there. be over until this mess of clouds will finally be gone. tension wires, fire fighters are very busy this night. Odette moves inland over Hispaniola. miles south of Barahona Dominican Republic. strengthen again later on Sunday. far it's been quite here. Until now no strong winds or heavy rainfalls. flooding es expected later this night. Until now we still have power, internet, phone, CableTV. I will post again if possible later, as soon the situation will change here. made already landfall in Pedernales, at the south-west tip of the country. wind, right now is not raining, but still cloudy and light windy. increase as we reach this night. update the page and the reports... no comments. Right now, it's being raining since a couple of hours, light raining though. Temperature is cool, some people on street are cold, too many sneezing. night for many as water may be a problem, keeping water out from our houses. moving NE (toward to us) with sustained winds of 50 mph. university, it depends on how weather is. We are under Tropical Storm warning. the storm's center will be over our island tomorrow. allready a huricane Cat1 at the moment. the moment with only a light breeze of 7.6 knts. over the mountains where the soil is already bare and defoliated. I will keep you updated as soon the situation changes here. just at the corner, but weather is unpredictable. just heard on radio this warning, i couldn't believe it, but tehre it is,. now, so that means rains are coming anytime. for the Dominican Republic from Isla Saona westward. moving toward the east-northeast near 7 km/hr. allready soked and wet in about 30 to 36 hrs from now (Saturday afternoon). the center reaches the high terrain of Hispaniola. the mountains) are scary. We will have towels and mops ready. classified as a tropical depression. is highly uncertain. The best estimate is 025/09. didn't recover quite from the recent heavy rains 2 weeks ago. More reports to come, stay tuned. internet and phones still working. to view pictures of the flooding in a small village on the North Coast. Sigh, will it never end? October 21 and 22 were unusual days in Ban�, just 65 km southwest of Santo Domingo. Usually we get very little rain, as we live on the edge of a desert, and when we do, it might rain for 30 minutes to an hour, usually at night. However, on Tuesday and Wednesday of this week, we had two really good downpours, especially on the Tuesday, when it rained really hard for about three hours and then heavy rain for at least two more. The streets were like rivers and we had cement blocks outside our door to prevent the rain from coming in. In areas of the city where there is no pavement, there was just mud and now there are ruts as well as mud. One lady was killed when a wall fell on her house. However, we are very glad that it was not a hurricane. has persisted these couple of weeks. (the lake either does not have water exit). stormy day, they got guts to dare saying that. yesterday, we could feel fresh wind coming from south, gentle wind. time to time you could see gray clouds covering capital's boarder. 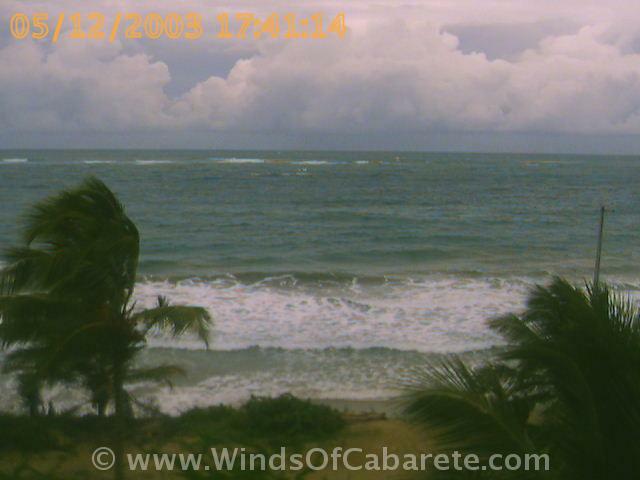 line (cabeza de toro), and Punta Cana is getting some winds. located, about 150 Km from east tip). Heavy rain is to come by 2am (early saturday). covered by clouds, radar images proofs it. houses, and minor damage in general, the vibrations felt nation wide. attack, two ppl impressed by the situation. of damage, we got an earthquake. I hope natural destructive forces let us in peace, at least for a while. but indirect victim, as the man got a heart attack impressed by the shock. However, until now (3:16pm EST) no fatal victims were reported. that could be felt in western Puerto Rico. director of the Puerto Rico Seismic Network. however, where there will likely be aftershocks felt." wing of the main hospital in Santiago, a town south of Puerto Plata. The earthquake was felt as far away as western Puerto Rico. Beach Resort. "We just have a lot of nervous guests." The earthquake struck just after midnight. but everything looks alright. There's not a lot of damage." aftershocks can be felt until now every hour or so. several stores, some of them completly collapsed. attack during the first shock. but it could have been much worst. local weather news says we may get rain. damage to building, but thanks God nobody, until now, was report to dead. happen, then we can say that we are getting a beautiful morning. this is my second report since I decided to be your new reporter. Well, it was to hope that indirect effects as far as precipitation and abnormal surges were producing by Isabel. Last night rain with thunderstorm were still registering in the city of Santo Domingo and others cities around the country. Other reports confirmed to us that 14 houses were flooded by penetration of sea the last weekend in our North coast, specifically, Playa Oeste in Puerto Plata. The conditions of the sea are even anomalous in the North coasts of Dominican Republic however gradually returning to the normality. dream that thunders couldn't wake me up though). knows how to do it. Hemos estado observando el comportamiento del poderoso huracan Isabel y aunque sus efectos destructivos no hayan afectado al pais, fuertes oleajes con rompientes se han estado observando desde ayer en nuetro litoral de la Bahia Escosesa. Aun en la costa norte no se ha manifestado el oleaje con anormalidad. see only a few waves breaking out at the reef. No high tides here either. Isabel will pass us in a save distance. newspapers are just ignoring it. it will turn WNW, and so it did. system as it is making its way towards to those locations. 375 miles northeast of San Juan Puerto Rico. so Isabel is a category 5 hurricane once again. as the Nothcoast of the Dominican Republic. North means good news for us. - the 11 am update..
...650 km...northeast of San Juan Puerto Rico. the storms size we will see some rain and high waves. Weather forecasters continue to show Isabel passing north of the Dominican Republic. Just how far north is still uncertain. Thus, the storm should continue to be closely monitored, given its diameter of about 700 miles. As of the 11 am AST the National Hurricane Center moved the official track further south. The National Hurricane Center forecasters dropped 2 degrees of latitude from the track crossing at 70W in 24 hours, or 24.5N (down from 26.5). The current official position puts the eye about 350 miles off the coast. Residents in the north coast of the Dominican Republic should be aware that precautions need to be taken if it turns any further south. As of the 11 am report on Friday, Isabel continues to be a category 5 hurricane with sustained wind speeds of 260kph (160mph). Wind gusts are reaching 315kph (195mph). The report states that the hurricane was centered at 21.6N and 57.8W or approximately 1,210km (752 miles) east-northeast of the Samana peninsula. The storm has slowed somewhat and has been moving mostly due west for the last forty-eight hours at just 15kph (9mph). The latest forecast is for the center of Isabel to pass 525km (325mi) north of Sosua. At this distance the heaviest squalls and strongest winds would remain just offshore. However, large, long ocean swells will be affecting the north coast beaches beginning this weekend. Small craft and high surf advisories have been posted for Puerto Rico and its nearby surrounding islands. - ATT. ppl from north coast. north of Saman� to Monte Cristi, also Puerto Plata) is over the 20s. north coast to feel TS winds. official sites, don't listen to me, but keep in mind what i say. miles...600 km...northeast of the northern Leeward Islands. 21 is about 66 miles (too close for us here at the northcoast to be save). south then forcasted we will have here some real problems. far she keeps going West). Keep your fingers crossed, that this North turn will be before Monday! begin reporting from it as it pass to the north of Hispaniola. more possible if it make a tiny little turn to south. moderate winds, if isabel remain well packed, we will hardly get rain. keep a close eye to this TS. Meanwhile, everybody noticed that Isabel is going towards US east coast. greetings from the North coast of the Dominican Republic. erosion and lots of rain. another incredible hot sunny day. - Fabian finally turning North! CONTINUE OVER THE NEXT 24 HOURS. and a steady path to the North would have meant that we get a direct hit. Hope Fabian will continue his way to the north now and miss us all. is why it have gotten time to develope a lot. track, then it will hit Puerto Rico and Dominican Rep.
living in caribbean, BECAUSE THIS WAVES WON'T LET US WATCH!!! Watching the radar, maybe we will be able to see it tomorrow night. about 27 degrees, feeling like in some occasions like 29 C.
It's raining cats and dogs once again in Santo Domingo. Yesterday we had a pretty nice storm around 1pm and today it's quieter but still a lot of rain. The streets are more or less full of water and people are just pretty much waiting it out. Hopefully by tomorrow it'll have passed and we'll get a least one rain free day! Right now, couple of clouds, but sun is shinning a bit more. If something unexpected happens I will get back to you. movie, cuz is really ugly out there (car jams). Well, that is it for now, i'll keep watching the storm. just understand, that is important). (between Puerto Rico And the Eastern Part of the Hispaniola). TD 9 advances in its trayectory. or two to go, but that's about all we should be getting. Friday, August 22, 2003 1:30 p.m. Tropical Depression 9 is now inundating Santo Domingo with heavy rains causing streets to flood. Winds are gusty causing blowing rain and lightning with booming thunders afterwards is frequent. I 'll keep you informed from the Dominican Republic. This is it, really really heavy rain is falling, Santo Domingo is soaking. I am tracking the storm to see what happens. that could last the day. moves west. There have been scattered thunders. much more organized, than it did yesterday. Let's see who will come today, TD9 or Fabian. - Keep an eye to that thing! 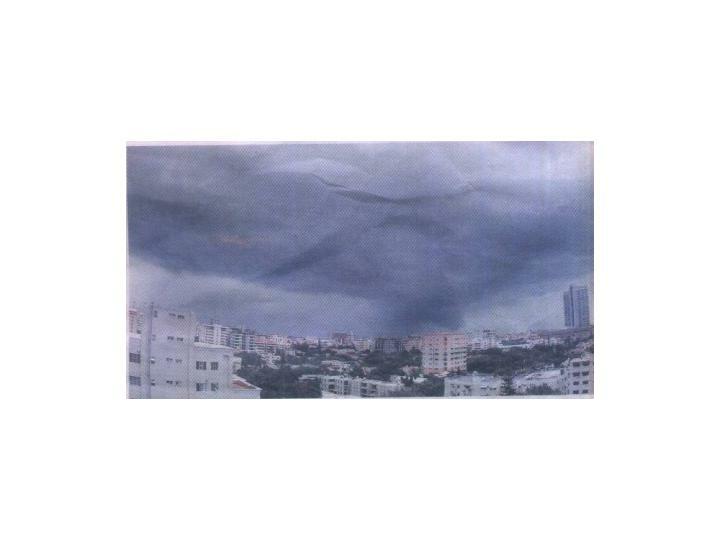 city, I don't know if majority of dominicans noticed it. I did. cloudy and few rain is falling. area of the country has records for 38 C, in 1998. 27C, but feeling like 29C!!! So, a little rain is always welcome, rain and lots of clouds!! No tropical system is threating our island. Dark sky, full with thick clouds, thunder and lightning. Not the best holiday wheater for the tourists. us soaking rain and not big deal of wind gust. no sign of tropical system getting near. pm most of it was over. This morning the skies are still grey, but everything is quiet. This is quaqualita from Caberete, North Coast of the Dominican Republic with my first weather post. The Dominican Republic is on the track of the remains of Tropical Depression 6. Heavy rain and wind is expected for today afternoon and the night. Right now in the southeast dark clouds in the sky can be seen and I also just heard the first thunders. Since it's very unlikely that this Tropical Wave will re-develop to a stronger storm, we hope that we just get some very much needed rain showers. I will post another update, in case situation will change.